If you’re like me, you’ve been considering a white set-up for your little hamster with a big persona. I’ve enjoyed looking at white cages, bedding, and accessories. Not only do white cages they look great in their own right, but they are also easy to work into your room design. I’m not saying this should ever be your first consideration when choosing any pet’s habitat, but if you do find a good one, then why not take decor into consideration too? 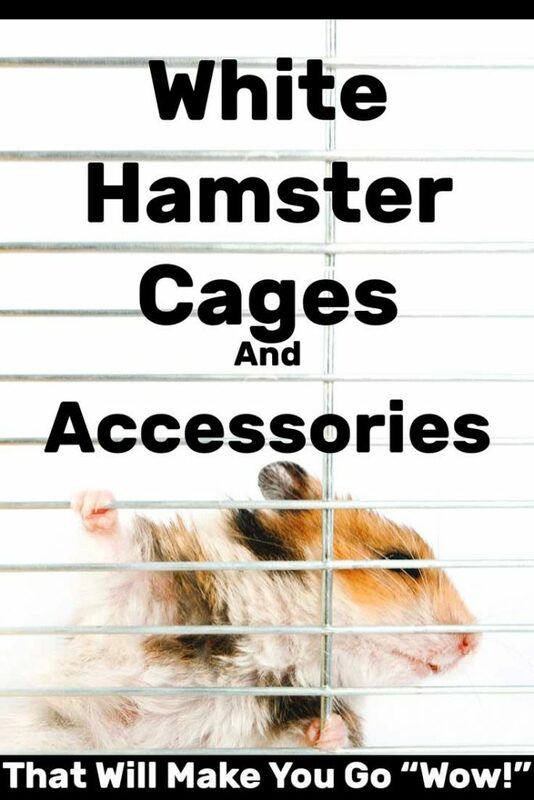 Check out below for some lovely, white hamster cages and cage accessories that I’ve found. The white cage, covered with a rust-resistant coating, makes for easy cleaning, allowing you to keep that new look. Made up of three floors and sporting two ladders, your hamsters will enjoy climbing to different levels. With the bars spaced 3/8 inches apart for safety, the bottom tray pulls out from below a wire mesh for a quick wipe. Two front doors allow for easy access to your pet with two convenient handles at each end of the cage for moving as necessary. Hamster lovers will find this a pleasing home for their pet. Check out this home for your hamster, click here. This habitat will amaze hamster lovers not only with its exercise ball but with the four exercise wheels in addition. Pure white with colored areas highlighted in orange, the cage has no fewer than three feeding dishes. In addition, the cage includes one water bottle and nine feet of tubes for your cute pet to climb through. The cage saves space, measuring 25″ in height, 16″ wide and 11″ deep. Access your pet through the front door and top exercise ball. For safety, the bars are 3/16″ apart. The design of the cage is attractive, once assembled, and plenty of bedding may be placed on the bottom level as it is deep. No worries about spilling! To check out this cage for your furry one, click here. 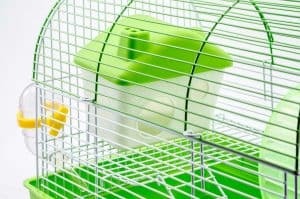 Although Little Friends uses Gerbilarium in the title, the company describes the cage as appropriate for hamsters. The white and glass cage deters chewing with the deep glass base providing much room for burrowing in thick, comfortable bedding. Sized at 51x28x40 cm, the accessories include two tiers reached by ramps textured for little feet. The levels allow room for the feeding dish, exercise wheel, and hamster house included. For more information on this cage, check out the website here. With a white base, wire cage, and orange and white accessories, this hamster cage will provide lots of fun for your hamster and look beautiful in any room too. With two tiers to explore, the exercise wheel, feeding dish, and hamster house are located at different levels. One of the advantages advantage of this 16x10x9.5 Habitrail cage is that additional compartments can be added to it. A deep base helps to prevent spilling of bedding and keeps it in the cage where it belongs. There is also a lock for the door to prevent a mischievous hamster from escaping. The exercise wheel’s design makes it noiseless. To find out more about this hamster cage, take a look at the website here. If you’re wanting all accessories in your white cage to be white also, then this bedding would be perfect. White and fluffy, this bedding is easy for your hamster to burrow through. It’s 99% dust free and hasn’t been dyed or bleached. This light-weight bedding is not only dust free but is also odor free. This bedding is sure to be a great match for a sleek, white cage. Whether your beloved pet uses this Mable Ruth hideout to hide or sleep, you’ll find that it’s a great design due to its wide base. The ceramic makes for easy cleaning, and the shiny surface contributes to that. This hideout is small enough to easily remove from the cage for cleaning and replacing. Your hamster will love the ease of entering through the wide mouth of the hideout. For more information on the white Ceramic Hamster Hideout, click here. Or read more about hamster houses and hideouts here. This sleek, white water dispenser will hold 8 oz. of water for your hammy, so you can rest assured during short trips away, that your hamster will be supplied with water. Sized at length 4.2″ width: 2.9″ height:3.5″, the dispenser will fit well in most cages and be an asset to any collection of white hamster cage accessories. Hamster lovers will love that this dispenser is designed to be leak proof and quieter than a typical water bottle. People who purchased this, say cleaning is a cinch with boiling water, and that their pets preferred this water dispenser over the water bottle. Click here to go to the website for this water dispenser. Your hamster is sure to have fun on this beautiful, white see-saw. It’s plastic and wood design makes it non-toxic and safe for your pet. Being waterproof, it also protects the toy in the event of a leaky water bottle. Measuring at 5.12*2.75* 1.97 inches, it’s the perfect size for your little critter. To find out more about the Hamster See-Saw, check out this website here. Of course, there’s more to choosing hamster toys than just color. 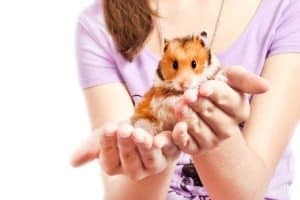 You can click here to learn more about hamster toys and how to choose the right ones for your furry friend. Enjoy watching your Dwarf Hamster play in his/her white, Moon-Glow exercise ball, and rest assured the little critter is getting a healthy amount of exercise. Safe and secure, the exercise ball may also be a great place to keep your pet while cleaning the cage. At five inches in diameter, it’s the perfect size for your dwarf hamster. To see more information about this item, click here. Please remember that not all hamsters do well with exercise balls. Even if your hammy enjoys exploring the world in one, you should always monitor him or her while in the ball and avoid leaving the little critter inside for too long. Read this: How long can you keep a hamster in a ball for? Now that we have covered this great exercise ball for dwarf hamsters, we’ll not leave out our larger Syrian Hammies. This exercise ball has all of the same qualities as for the dwarf hamster, except this ball reaches 7 inches in diameter. Customers state they are satisfied with using this ball with their Syrian hamsters. Again, please be mindful of your hammy’s well-being while she or he is inside the ball. It may be too stressful for some hamsters, so introduce this activity gradually and always keep an eye on your hamster when using the ball. To see the larger Moon Glow exercise ball, click here. Made of calcium and mineral, hamsters love chewing on the white blocks. The calcium is a healthy addition to their environment, and the blocks may be fastened to the cage. This is a great way for hamsters to keep their teeth healthy. Pet lovers have the option of choosing from two sizes: small or large. To see more, click here. Not sure what chew toys are? We’ve got you covered. Click here to learn about chew toys for hamsters and why your hammy will benefit from them (including recommendations for a variety of top-quality chew toys). This lovely white swing is eco wood and does not crack. Being waterproof, your hamster is sure to spend much time resting in or playing on the Hamster Hammock Swing. The non-toxic hammock will increase your critter’s activity level and provide a choice of activities. Sized at 3.54*2.95*0.2″, your hamster’s toy should fit most cages. To find out more, click here for the web page. And if you think this is an odd concept, then you really should read our post about hammocks for hamsters! Jolin’s food dish is ceramic which gives enough weight to prevent the dish from being overturned. The ceramic surface deters chewing and is easy to clean. With the size, diameter 6cm*Height 4.3cm, the dish fits conveniently in a corner of any cage. To find out more about Jolin’s Shop food dish, click here. Food dishes are one of the best elements to use when trying to make your hamster’s cage prettier. There are some gorgeous designs out there and you can see more of them in our post about hamster food dishes. Have you tried any of the products listed above? What did you and your hamster think of it? Let us know down in the comment section! And if you’re not sure about white just yet, make sure you check out the sister post on blue hamster cages and accessories!